Also, The Firebird Suite. David Bernard, Park Avenue Chamber Symphony. Recursive Classics RC2058479. This is the third album I've reviewed from Maestro David Bernard and his Park Avenue Chamber Symphony. You'll remember, either from listening to them yourself or from reviews, that the Park Avenue ensemble is composed of players who are not full-time professional musicians but rather are from other walks of life: hedge-fund managers, philanthropists, CEO's, UN officials, doctors, lawyers, candlestick makers). They're not amateurs, but they're not full-time, paid musicians, either. Fortunately, once you hear them, their playing dispels any skepticism you might have about their musicianship. They are a fine group. You might also note that the Park Avenue Chamber Symphony is not a particularly small group, despite their name. It's not the limited size an ordinary chamber orchestra; in fact, judging by photos, it can be over 100 players strong. However, as Maestro Bernard explains, they can sometimes sound smaller because he favors a lean, transparent sound. In any case, in the present album of works by Stravinsky, the group's size works to their advantage. Their numbers are big enough to convey the scope of Stravinsky's pieces but transparent enough to provide added intimacy. Russian-born U.S. composer Igor Stravinsky (1882-1971) premiered his ballet The Rite of Spring in 1913, and it has rightfully taken its place among the most influential works of the twentieth century. Nevertheless, its first public performance was anything but smooth. I recall an interview with the composer reminiscing about it: He said people booed him out of the concert hall, and he had to leave by a side door, the music so outraged the audience. Today, of course, we accept the ballet as one of the staples of the classical repertoire. Theatergoers at the premiere, apparently used to elegant, refined dance music in their ballets, had no idea what Stravinsky was up to with his savage, often ferocious beats describing some kind of ancient fertility rite. Nor did they understand the choreography of the first performance. The composer subtitled his work "Pictures from Pagan Russia," and one can understand why. The score's driving rhythms helped shape the path of subsequent twentieth-century music, making Stravinsky not only controversial but genuinely revolutionary. The question these days is how to approach it in the twenty-first century when practically every conductor on Earth, including Stravinsky himself, has already had his or her way with it. Certainly, the music's combination of lyrical charm, fire, and passion needs to come into the equation, and this is where Maestro Bernard does his thing. He and his crew put in a fine, passionate performance reminiscent of one my favorites with Leonard Bernstein (who described the music as "a kind of prehistoric jazz") and the New York Philharmonic. Maybe Bernard doesn't displace Bernstein in my affections, but he gives him a good run. Anyway, in Part One: The Adoration of the Earth, we get an atmospheric Introduction and Augurs of Spring, with well-developed rhythms that never seem merely like a series of starts and stops. Still, under Bernard the opening seems a trifle hurried and not quite so magically ominous as with Bernstein. Then the pulsating sections of the pagan rituals begin and Bernard's insistent forward momentum pays off. We know from the outset this is going to be a more exciting performance than an airy one. In Part Two: The Sacrifice, Stravinsky presses forward, quietly building the atmospheric suspense until the pulse of the music reaches a hectic crescendo. Again, Bernard dispenses with some of the more aerial qualities of the music to get on to the passion and fervor of the piece. Here, he does a fine job creating and maintaining the music's savage beats, and the audio engineers uphold their part with highly dynamic sound. 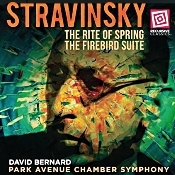 The inclusion of Stravinsky's 1919 suite from his dynamic fairy-tale ballet The Firebird makes an attractive coupling. Bernard and company bring the same sense of urgency to the performance they did with The Rite, but they complement it with greater feeling and a smoother flow. And as always the orchestra is highly responsive to Bernard's direction. I actually enjoyed the conductor's handling of the suite better than I did The Rite. A minor annoyance: While the folks at Recursive Classics provide timings for each of the various sections of The Rite, they could have numbered the tracks. If you're looking for a particular selection, it's difficult to find the one you want without a numbering system for the disc. Audio engineers Joseph Patrych and Antonio Oliart recorded The Rite of Spring in February 2015 and The Firebird Suite in January 2017 at the DiMenna Center for Classical Music, New York City. It becomes immediately apparent in The Rite that the sound is realistically deep and dimensional, with excellent clarity and strong definition among the instruments. The high midrange can be a tad strident at times, but most of the frequency range is fairly natural sounding. Combined with a good degree of dynamic impact and a fairly wide response, the resultant sonics are impressively thrilling. The sound in The Firebird, recorded almost two years later, seems to my ears more realistic than in The Rite--warmer, rounder, softer, smoother, yet just as dynamic. The American spirit runs through the canyons in Moab during the 26th annual Moab Music Festival (MMF) from August 27 – September 13, 2018. 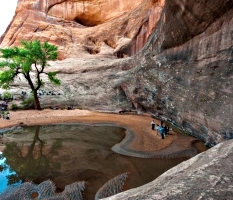 "Music in Concert with the Landscape" comes to life with performances set in spectacular outdoor venues along the Colorado River, in the charming and historic Star Hall, in private indoor salons, and surprise outdoor settings, all with the world-class Moab Music Festival musicians as a guide. Patrons will experience musical hikes, rafting adventures, intimate gatherings, and virtuoso performances, all surrounded by the sky, the Colorado River, and the ruggedly stunning red rock desert of southeast Utah--a backdrop for the musical ride of a lifetime. "The combination of music set against the canyonlands background is, in a word, stirring." (Denver Magazine 5280) Come, sit, be still, and hear your inner voice echoed in the striking sandstone canyons. Gargoyle Ensemble and St. Charles Singers' "Transfigured Shakespeare"
The Chicago Gargoyle Brass and Organ Ensemble and St. Charles Singers will headline a concert titled "Transfigured Shakespeare" at 7:30 p.m. on Friday, May 11, 2018, at Baker Memorial United Methodist Church, 307 Cedar Ave., St. Charles, Illinois. Highlights will include the world premiere of a brass-and-organ arrangement of trail-blazing composer Arnold Schoenberg's sublime, late-Romantic tone poem "Transfigured Night" and the second-ever performance of Peter Meechan's "Love Songs (Shakespeare)" for brass quintet, organ, choir, and narrator. The concert, presented by the Fox Valley Chapter of the American Guild of Organists and open to the public, will be the first collaboration between the Chicago Gargoyle ensemble and the St. Charles Singers. Single tickets for "Transfigured Shakespeare" are $20 adult general admission, $15 seniors, and free for those 18 and younger. Tickets are available at gargoylebrass.com and at the door. For additional information, call the Chicago Gargoyle ensemble's Rodney Holmes at (708) 975-0055. Washington Performing Arts has just announced its 52nd annual season, comprising 40 events across six venues in the Greater D.C. region. Furthering the defining "Everybody in, nobody out" philosophy of the organization's founder, Patrick Hayes, the season embraces both diversity and innovation on many levels: presenting an expansive range of artistic styles and genres; representing the traditions of many cultures, including the artistic riches to be found in D.C. itself; commissioning and premiering new works; presenting dream projects of many of today's most prominent artists; nurturing the careers of emerging artists; and uniting main stage concert programming with robust education and community initiatives through artist residencies and both new and long-term institutional partnerships. "Through their work and creative choices, artists have always captured and conveyed the spirit of our time," said Jenny Bilfield, President & CEO of Washington Performing Arts. "Our goal has long been to provide them with a platform to do their best, most resonant work. We were drawn to programs and collaborations that are gutsy and unusual, and to projects where humanist topics are probed with tenderness and insight. We invite our audiences to join us with open ears, minds, and hearts." 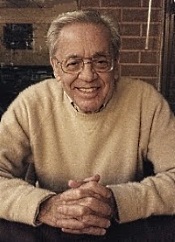 Several Washington Performing Arts commissions, including Jimmy López's oratorio Dreamer with libretto by Nilo Cruz; works by Andreia Pinto Correia and Gity Razaz for Yevgeny Kutik's "Music from the Suitcase" program; and works on Lara Downes's new program "Holes in the Sky" with special guest Rhiannon Giddens. The D.C. debut of the West-Eastern Divan Orchestra under Daniel Barenboim. Yo-Yo Ma performing Bach's complete Cello Suites in the spectacular Washington National Cathedral. Kronos Quartet with a program of works by composers from the seven predominantly Muslim countries affected by the 2017 "travel ban." Subscriptions go on sale to the general public Tuesday, May 8, 2018 at 9:30 a.m. at WashingtonPerformingArts.org, by phone at (202) 785-9727, and in person at the Washington Performing Arts Ticket Office, located at 1400 K Street NW, Suite 500. A series of advance sales periods for Friends (annual donors) begins Wednesday, April 25, at 9:30 a.m. A complete listing of 2018/19 season artists and events will be available online as of April 24 at WashingtonPerformingArts.org. 19-year-old cellist, Sheku Kanneh-Mason won BBC Young Musician 2016, made his BBC Proms debut the following year, and released his debut album, 'Inspiration', earlier this year. Sheku is a student at the Royal Academy of Music and combines his studies there with a busy international concert career. He is passionate about making classical music accessible to all and is Junior Ambassador for the music education charity London Music Masters. Last June, Prince Harry saw Sheku play at an event in London in support of the work of Antiguan charity the Halo Foundation. Sheku Kanneh-Mason says: "I'm so excited and honoured to perform at Prince Harry and Meghan Markle's wedding. I was bowled over when Ms Markle called me to ask if I would play during the ceremony, and of course I immediately said yes! What a privilege to be able to play the cello at such a wonderful event. I can't wait!" When Prince Harry marries Ms. Meghan Markle next month, the Royal Wedding Ceremony will be recorded live and released on Decca Records within hours of the service ending. Decca, one of Britain's most historic record labels, will have the privilege of capturing the entire service. The official recording of the Wedding Service, to be held at St George's Chapel, Windsor Castle on Saturday, May 19, will be available to listen to at home that same day, then released into retail stores around the world from May 25. Musicians confirmed to perform at the wedding ceremony include British cellist Sheku Kanneh Mason, Welsh soprano Elin Manahan Thomas, The Choir of St George's Chapel and Christian gospel group The Kingdom Choir. The Orchestra, conducted by Christopher Warren-Green, will be made up of musicians from the BBC National Orchestra of Wales, the English Chamber Orchestra and the Philharmonia. State Trumpeters are drawn from all ranks of the Band of the Household Cavalry, and will provide ceremonial support during the Service at St George's Chapel. 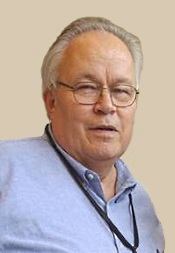 The music will be under the direction of James Vivian, Director of Music, St George's Chapel. American Bach Soloists will perform all four of Bach's Orchestral Suites for the first time on one program. ABS Music Director Jeffrey Thomas will lead the American Bach Soloists in performances of all four of Johann Sebastian Bach's Orchestral Suites (BWV 1066-1069) May 11-14 in Belvedere, Berkeley, San Francisco, and Davis, California. The works presented in these concerts are full of exuberant sonority and captivating melody and display the virtuosity of ABS's famous roster of "the best American specialists in early Music" (The Washington Post). These extremely popular pieces are intensely infused with the spirit of dance, expressing joy and felicity. New Century Chamber Orchestra's upcoming performances "Philip Glass Premiere" May 17 through 20, featuring pianist Simone Dinnerstein and Guest Concertmaster Zachary DePue. Four performances will be given around the Bay Area in Berkeley, Palo Alto, San Francisco, and San Rafael, California. New Century Chamber Orchestra concludes its 2017-2018 season with the West Coast Premiere of Philip Glass's Piano Concerto No. 3 featuring Simone Dinnerstein. Appearing as piano soloist, Dinnerstein will perform this work alongside Bach's Keyboard Concerto No. 7 in G minor. Indianapolis Symphony concertmaster Zachary DePue serves as Guest Concertmaster in a program that also features works by Henry Purcell (arr. Britten), Bryce Dessner, and Francesco Geminiani. Also, The Oceanides; Finlandia; Valse triste; Tapiola; Nightride & Sunrise. 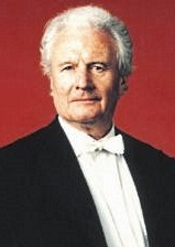 Sir Colin Davis, London Symphony Orchestra. RCA 09026-68770-2. 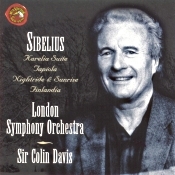 To cap his complete Sibelius symphony cycle, the late Sir Colin Davis gave us big, sweeping interpretations of some of the composer's most-famous tone poems. And RCA provided audio to match. The warmhearted readings are born of years of experience and maturity, and while they may not provide the utmost in excitement, they do conjure up fairly appropriate images and feelings. Frankly, however, none of the interpretations individually would be among my absolute first-choice recommendations, though collectively they make a decent-enough package. The Karelia Suite is more regal and more stately than one usually hears it, but I prefer Sir John Barbirolli's more incisive rendering (EMI). The Oceanides is flavorsome, but it's hard when listening to it not to think of Sir Thomas Beecham's celebrated recording (EMI), and Davis again ends up second best. Finlandia comes off grandly, filled with imposing gestures, yet it, too, lags one step behind Vladimir Ashkenazy's more overtly dramatic realization (Decca). And so it goes. Probably the best performance on the disc is the concluding one, Nightride & Sunrise, which Davis fills with all the moody contrasts this dark, woodsy, naturalistic piece demands. Producer Michael Bremner and engineer Tony Faulkner recorded the music between 1992 and 1998. The resultant sonics are of the warm, weighty variety, sometimes billowy yet overall subdued. The sound nicely complements Davis's broadly relaxed style in the poems, but comparisons to the aforementioned Barbirolli or Ashkenazy make the new disc sound distinctly soft and bland. Turning up the volume doesn't hurt. I also found myself wishing for greater orchestral depth, although the sound is not unlike the ambiance of many large concert halls. Interestingly, RCA recorded the six pieces on the program in three different locations, yet they sound remarkably alike. Let me just say that if your stereo system tends even slightly toward the hard or strident, the compensating factors of this new collection will suit your needs pretty well. Eybler Quartet. CORO Connections COR16164. For those of you who don't know them, the Eybler Quartet are a unique group of musicians who play historically informed performances on period instruments. Their Web site describes them as coming "together in late 2004 to explore the works of the first century of the string quartet, with a healthy attention to lesser known composers such as their namesake, Joseph Leopold Edler von Eybler. The group plays on instruments appropriate to the period of the music it performs. Violinist Julia Wedman and violist Patrick G. Jordan are members of Tafelmusik Baroque Orchestra; violinist Aisslinn Nosky is concertmaster of the Handel and Haydn Society and Principal Guest Conductor of the Niagara Symphony Orchestra; Julia and Aisslinn are also members of I FURIOSI Baroque Ensemble. Cellist Margaret Gay is much in demand as both a modern and period instrument player. The group brings a unique combination of talents and skills: years of collective experience as chamber musicians, technical prowess, experience in period instrument performance and an unquenchable passion for the repertoire." 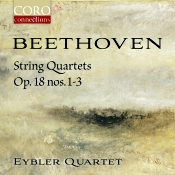 As of this album, the Eybler Quartet has five albums to their credit, mostly of music by Haydn, Mozart, Vanhal, Backofen, and their namesake, the aforementioned Austrian composer and conductor Joseph Eybler (1765-1846). Here, the Eybler ensemble tackle Beethoven, and, appropriately, they do the first three (Op. 18) of his sixteen string quartets. If you like chamber music and you like Beethoven, there's plenty of both around, but to hear theses early Beethoven quartets played in something approaching what Beethoven himself might have heard (which, given his deteriorating hearing isn't saying a lot), the Eybler group is hard to beat. The program begins with the String Quartet in F major, Op. 18, No. 1, the composer's second attempt at string quartet writing (actually composing No. 3 first). Next is the even more scintillating String Quartet in G major, Op. 18, No. 2, followed by the energetic String Quartet in D major, Op. 18, No. 3. Beethoven wrote all three of them between 1798 and 1800 and published them in 1801. Of course, one has to adjust slightly to the sound of period instruments. They sound not quite so smooth or mellifluous as modern ones. Yet that only increases their uniqueness, and because the Eybler Quartet play in a delightfully energetic and thoroughly engaging style, the instrumental sound enhances the charm of the playing. Nor should one be hesitant about the Eybler's historical performances. Although the Eyblers adhere to Beethoven's tempo marks, which most traditional readings do not, these are no hell-bent-for-leather dashes to the finish line; they are well-judged, carefully considered, emotionally coherent interpretations that adhere to the composer's intentions while giving rein to the group's individual character. So what we have in the Eybler renditions are authentic (or as close as they can get), lively, vigorous, sparkling realizations of Beethoven's scores. They move along at a zippy pace yet don't feel rushed or hurried in any way. The group's articulation is always clean, their ensemble always closely unified, the whole always beyond the particular player. The results are most enjoyable, whether in the sublime slow movements or the sprightly fast ones. Not that it matters, but I enjoyed No. 2 best of all. Despite its hints of Haydn and Mozart, it appears to me the most inventive of Beethoven's first three quartets. Even though you may find other performances more dramatic or more Romantic, the Eyblers do it justice in every way, never sentimentalizing it or overemphasizing contrasts. Producer Dan Merceruio and engineer Ron Searles recorded the music at the Glenn Gould Studio, Toronto, Ontario in June and July 2015. The sound is among the better I've heard in a chamber or small-group performance. The instruments are a little close, but they are realistically placed across the sound stage, with excellent definition and delineation. What's more important, although they are a bit close up, the instruments are never hard or bright. They sound quite natural, with a shimmer and shine and a warm glow as well, the studio ambience nicely captured. Concluding the Music Institute of Chicago's Faculty and Guest Artist Series' 2017–18 season, the Academy Orchestra performs with noted violinist Ilana Setapen Saturday, May 26 at 7:30 p.m. at Nichols Concert Hall, 1490 Chicago Ave., Evanston, Illinois. The program includes the Overture to Mozart's opera The Impresario; Copland's "Down a Country Lane"; and Mendelssohn's Symphony No. 3 "Scottish." Setapen joins the Orchestra for the program's second half, Tchaikovsky's Violin Concerto in D Major, Op. 35. Conducting the program is Academy Director James Setapen, Ilana's father. The Academy of the Music Institute of Chicago, led by Director James Setapen, is a nationally recognized training center for highly gifted pre-college pianists and string players that provides a comprehensive music education for students who aspire to be professional musicians. Faculty, staff, and students come together for an intensive 30-week program that includes private lessons with Academy artist faculty, a rigorous chamber music component, a stimulating chamber orchestra experience, and accelerated music theory classes. Pianists additionally study keyboard history and literature, improvisation, and keyboard skills in an intimate group setting. A hallmark of the Academy is the weekly master class series when students perform for and observe acclaimed musicians and educators who share their knowledge. The Academy faculty, who teach at some of the country's most prestigious conservatories and music schools, have a passion for developing young talent and an established track record of student achievement. 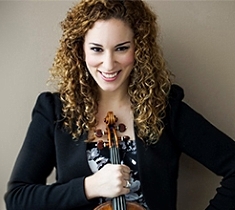 The Music Institute of Chicago's Academy Orchestra concert featuring violinist Ilana Setapen takes place Saturday, May 26 at 7:30 p.m. at Nichols Concert Hall, 1490 Chicago Avenue in Evanston. Tickets are $30 for adults, $20 for seniors and $10 for students, available at 847.905.1500 ext. 108 or musicinst.org/nichols-concert-hall. All programming is subject to change. For more information, visit musicinst.org. The University Musical Society (UMS), under the leadership of President Matthew VanBesien, announced its 140th season in 2018-19 with an initial slate of 40 performances and events. One of the country's most acclaimed performing arts presenters, UMS honors its past by showcasing respected ensembles and performers with whom it has enjoyed rich relationships, and fully embraces the future as initiator, incubator, and accelerator for innovative new works and projects. This potent combination infuses the anniversary season with dynamic and diverse voices and perspectives featuring artists at the top of their game — celebrating the canon, taking risks, moving genres in new directions, disrupting stereotypes, and surprising audiences. "At UMS, we always commit to bringing a dazzling array of artists whose work amazes, entertains, comforts, and even provokes. We believe strongly in the importance of nurturing young talent and fostering experimentation, while also collaborating with those cherished artists and ensembles who have been a hallmark of our series. "We open our 140th season in September with three events that truly embody our strong sense of tradition, innovation, and collaboration: teaming up with the University of Michigan's College of Engineering to present a 50th anniversary live presentation of Stanley Kubrick's audacious 2001: A Space Odyssey to Michigan's campus, with the Detroit Symphony Orchestra and Musica Sacra chorus providing the live musical soundtrack; the legendary Philadelphia Orchestra, which served as the resident orchestra for Ann Arbor's May Festival for 49 years, returning to Hill Auditorium with new music director Yannick Nézet-Séguin; and actor Alec Baldwin, who comes to Ann Arbor to work with students and faculty in the U-M Department of Theatre & Drama on dramatic readings of Arthur Miller's great work, Death of a Salesman. That's just the first few weeks of our 140th season!" said UMS President Matthew VanBesien. "Our 2018-19 offerings also include an extraordinary world première project and many other moments during which UMS invites artists to use our spaces to freely experiment, develop, and refine new works, and to provide audiences with insights to the creative process and the first look at exciting performances." Subscription packages go on sale to renewing subscribers on Monday, April 23 and to the general public on Monday, May 1. Current subscribers will receive renewal packets in April. Subscribers may add on additional performances at any point during the subscription period. Tickets to individual events will go on sale to the general public online, in person, and by phone on Monday, August 13; UMS donors of $250+ may purchase beginning Monday, August 6. Groups of 10 or more may reserve tickets beginning Monday, July 9. To be added to the mailing list, please contact the UMS Ticket Office at 734.764.2538 or visit ums.org. UMS also has an e-mail list that provides up-to-date information about all UMS events; sign-up information is available on the website. After a successful North American debut of the live performance of his 8-hour masterpiece SLEEP, Max Richter brings the "intoxicating" (NPR) performance to New York City for the first time, for two nights of performances on May 4 & 5 at Spring Studios (50 Varick Street, New York, NY 10013). Doors will open at 9:00pm, the concert will begin at 10:30pm. Tickets are being announced on the artist's socials. At a recent Los Angles Master Chorale event, a technician asked the group's Director of the Marketing if the Master Chorale was the same organization that went into schools and taught kids how to write and sing songs. When it was affirmed that it was, he exclaimed: "I was one of those kids!" His fond memory of the "Voices Within" program 12 years after he participated illustrates the lasting impact the program has had on thousands of students since it was launched in 2001. This year's spring series of "Voices Within" concerts will take place at Hooper Avenue Elementary in South Los Angeles on Wednesday, April 25 and at Sheridan Street Elementary in Boyle Heights on Thursday, April 26, creating new memories for this season's 110 participants. The concerts are the culmination of the 12-week "Voices Within" program that brings three teaching artists—a composer, a lyricist, and a performer—into the schools to introduce the students to music ideas such as pitch, rhythm, and melody, and teaches them how to apply these concepts to songwriting. The students perform their songs for fellow students, teachers, and friends and family. Each school will give two performances. It is the first time that Hooper Avenue Elementary has taken part in the "Voices Within" program. New Century Chamber Orchestra concludes its 2017-2018 season, May 16 through 20, with the West Coast Premiere of Philip Glass's Piano Concerto No. 3, featuring Simone Dinnerstein. Appearing as piano soloist, Dinnerstein will perform this work alongside Bach's Keyboard Concerto No. 7 in G minor. Indianapolis Symphony concertmaster Zachary DePue serves as Guest Concertmaster in a program that also features Henry Purcell's Chacony in G minor (arr. Britten), Bryce Dessner's Aheym and Francesco Geminiani's Concerto Grosso No. 12 in D minor. This program will be presented as part of New Century's subscription series on four evenings in different locations around the the San Francisco Bay Area: Thursday, May 17 at 8 p.m., First Congregational Church, Berkeley, CA; Friday, May 18 at 8 p.m., Oshman Family JCC, Palo Alto, CA; Saturday, May 19 at 8 p.m., Herbst Theatre, San Francisco, and Sunday, May 20 at 3 p.m., Osher Marin JCC, San Rafael, CA. New Century will also feature in a special performance of this program on Wednesday, May 16 at 8 p.m. at UC Davis, CA, presented by the Mondavi Center of the Arts. There is a new video available for "Great Performances at the Met": L'Elisir d'Amore, which premieres Sunday, April 29 at 12:00 p.m. on PBS (check local listings). This series brings the best of the Metropolitan Opera into the homes of classical music fans across the United States. Donizetti's classic comic opera L'Elisir d'Amore features Pretty Yende as the feisty Adina, opposite Matthew Polenzani as Nemorino, with Davide Luciano as Belcore and Ildebrando D'Arcangelo as Dulcamara. Warner Classics has launched a new collaboration with IDAGIO, in a partnership that will see the specialist classical music streaming service make the entire Warner Classics and Erato catalogue available to its users. The IDAGIO catalogue, which already comprises over 650,000 tracks, will encompass all new and recent releases from the Warner Classics and Erato labels, as well as the complete catalogue, including recordings originally issued on such iconic labels as EMI Classics, Teldec (now Warner Classics), and Virgin Classics (now Erato). The name Jaroslav Kocian holds a special place in the hearts of Czech music-lovers, so much so that after that iconic violinist died a violin competition was established in his name, and in his beloved home town of Usti nad Orlici. It remains the oldest major violin competition in the world for under-sixteen-year-olds. 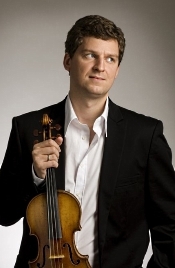 Its patron is a successor of Kocian as the leading Czech violinist, Pavel Sporcl. This year, to mark the competition's 60th anniversary, Sporcl has curated a gala concert at Prague's Smetana Concert Hall. He has invited for the occasion, the Prague Symphony Orchestra conducted by Jessica Cottis, and a line-up of laureates of the Kocian Violin Competition. Among them, Stefan Milenkovich, Josef Spacek, Bohuslav Matousek and others. Sporcl will play works by Kocian himself, Vivaldi, Saint-Saëns and will take part in the finale, a world premiere by Lukás Sommer for eight violinists called "Gala Violin - Concert Phantasy on Jaroslav Kocian Themes for Eight Soloists And Orchestra." The event will be recorded for broadcast by Czech Television. Margaret Price, soprano; Doris Soffel, alto; Peter Straka, tenor; Matthias Holle, bass; Sergiu Celibidache, Munich Philharmonic Orchestra and Chorus. EMI Classics CDC 7243-5-56702-2. 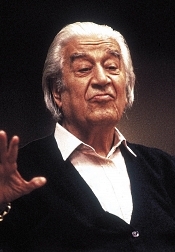 The late Romanian conductor and composer Sergiu Celibidache (1912-1996) must be the least-known famous conductor of the twentieth century. He brought it upon himself: He refused absolutely to record any of his music, believing that sound could only be "lived and experienced in real space." I respect his principles, but as a result he deprived about ninety-nine per cent of the classical music loving world of potentially great performances. So be it. After he passed on, however, his son helped to select a handful of his father's live taped sessions for release. 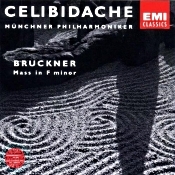 Among the first issues were Celibidache's Bruckner interpretations, for which he was well known. Any Bruckner work is characterized by its nobility, its grandeur, and its intense spirituality. No Bruckner offering could be more endowed with these qualities than his Mass in F minor. And these attributes are exactly what Celibidache delivers, using the 1881 Robert Haas edition. In some ways the conductor's approach is similar to his contemporary, Herbert von Karajan. There is always the grand gesture. But I felt a more profound sense of the sublime with this Celibidache recording than I usually get from the more bravura performances of Karajan. Celibidache's timing is that much more sweeping, the hushes more extended, the tempos more expansive. His broad view of things can nowhere be better found than in the big, central "Credo," where we find everything from the quietest whisper of a note to a full, fortissimo chorus, each punctuated with the greatest warmth of expression. By the time it's over, one must be in awe of both composer and conductor. But one thing that didn't impress me overmuch was the sound. It is rather antiseptic. There is clarity, to be sure, in this 1990 recording but at the expense of richness and sonority. The upper midrange is bright and often brittle, especially in massed vocal passages. I wouldn't let this deter one from buying the disc, though, if only for the experience of discovering a man so well known and so little heard. 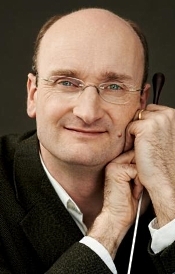 Andrew Manze, NDR Radiophilharmonie. Pentatone PTC 5186 611. The last time I heard English conductor and violinist Andrew Manze doing Mendelssohn, it was in the First and Third Symphonies, where his propensity for zippy, early music practice produced a pair of exciting but, for me, not entirely persuasive performances. 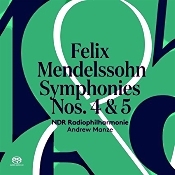 Continuing his Mendelssohn series, here he and the German radio orchestra NDR Radiophilharmonie tackle the popular Fourth Symphony and the more solemn Fifth. Although the disc would not displace my own old favorites, for Mendelssohn fans it might still provide a worthwhile listen. First up on the program is the Symphony No. 4 in A, Op. 90 "Italian," which Mendelssohn wrote after a trip to Italy and premiered 1833. The first movement Allegro is among the most recognizable of all the music Mendelssohn wrote for his symphonies. Then, music scholars think that the many religious processions Mendelssohn saw in Rome may have inspired the second-movement Andante. There follows a delicate minuet, and the work concludes with a whirlwind of music reminiscent of the composer's Midsummer Night's Dream. Despite my initial reservations that Manze's historical-performance inclinations might lead him to tempos at a more robust gait than I like, he actually takes things at a reasonably pleasant, if sometimes exhilarating pace. With well-judged dynamic inflections and an orchestra that seems to follow his every direction, the result in the first movement is as sunny as any, if a tad dark and billowy due to the recording's pronounced ambient bloom. Manze emphasizes the staccato motif of the second movement at perhaps a headier stride than other conductors often take, yet it seems to fit the strapping dimensions for the piece the conductor envisions. The rhapsodic elements of the third movement come to the fore under Manze, too, and he makes it a welcome contrast to the preceding parade-like passages. Then, the conductor provides a fittingly high-spirited finale that seems only mildly rushed. Mendelssohn's sister Fanny dubbed No. 5 in D Minor, Op. 107 the "Reformation Symphony" because its subject matter celebrated the Protestant Reformation. The composer wrote it, as I said, on commission--for some festivities in Berlin, but ill health prevented him from completing it and he finally premiered it in 1832. After a somber opening movement, the symphony moves to a much-lighter Allegro vivace and a lyrical Andante, all culminating in a finale based on Martin Luther's chorale "Ein feste Burg ist unser Gott" ("A mighty fortress is our God"). Here, Manze's big-scale yet intimate-feeling approach works quite well. His "Reformation" doesn't have the ponderous dimensions that some conductors seem to impose on it. Instead, it comes out more cohesive, more of a whole, tying the opening movements more closely to the last, giving the little Allegro its sprightly due and the Andante a gentle lilt. It all builds, of course, to that final chorale, which Manze handles splendidly, building and magnifying with a dignified grandeur. So, could I say that Manze's performance of the "Italian" symphony strikes my fancy more than several of my old favorites? Not exactly. My two favorites (among others) in the "Italian" could not be more different from one another nor more different from Manze's interpretation. They are the recordings by Claudio Abbado in his earlier Decca rendering and Otto Klemperer in his EMI reading. Both continue to strike me as having more sheer joy, zest, and charm than anybody else's. In the "Reformation," though, Manze is no doubt as good as anybody, and his realization should greatly please fans of the work. Producers Renaud Loranger and Matthias Llkenhans and engineer Martin Lohmann recorded the symphonies in the Grober Sendesaal desNDR Landesfunkhaus in January 2016 and February 2017. They made the hybrid recording for SACD multichannel and two-channel stereo playback via an SACD player as well as two-channel stereo via a regular CD player. I listened in two-channel SACD. The sound is much the same as Pentatone delivered for Manze's previous Mendelssohn disc, so I'll repeat what I said of it: There is a good deal of ambient reflection around the orchestra, almost too much. The reflections may sound realistic in multichannel, but in two-channel stereo they can be overmuch and somewhat obscure inner detailing. Still, it's not too distracting, and the overall sonic image is impressively dynamic. 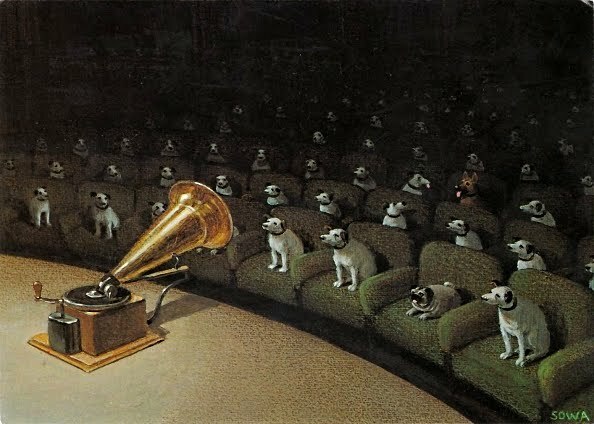 To be fair, there's enough of a lifelike quality about the sound to satisfy most listeners. As always with these things, the Pentatone folks do up the disc with a standard SACD case, further enclosed in a light-cardboard slipcover. My bewilderment continues, though, over what purpose a slipcover actually serves, but it is a handsome packaging feature, redundant or not. I wish I could say the same for the minimalist design of the album/booklet cover. Berkeley Festival and Exhibition announced its 2018 biennial festival, June 3 through 10, presented by the San Francisco Early Music Society. 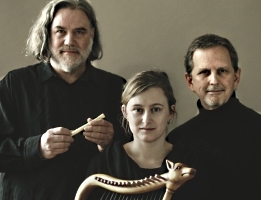 This year's Festival reimagines the concept of traditional Early Music by broadening the boundaries to include historically informed masterworks from as far back as the early Middle Ages through the Romantic era. Highlights include a Festival debut by legendary Early Music ensemble Sequentia in two performances that focus on important Latin texts from the Middle Ages; two programs dedicated to J.S. Bach's cantatas and motets featuring Belgian ensemble Vox Luminis in their third Festival appearance; a concert version recreation of Purcell's Dido and Aeneas co-presented by Voices of Music and the San Francisco Girls Chorus; a 19th-century salon-style presentation of solo and chamber works by Schumann and Schubert by musicians of the Valley of the Moon Festival and tenor Nick Phan; and the Festival's inaugural International Early Piano Competition devoted to Classical and Romantic music on historically appropriate instruments. The eight-day festival also includes over 50 self-produced concerts by participants from around the world as part of its Fringe Festival; a three-day exhibition, June 7 through 9, that brings together instrument makers, publishers, retailers and organizations; Young Artist Series featuring Seattle Historical Arts for Kids presentation of Handel's Serse, Davis Senior High School Baroque Ensemble, Juilliard415 and San Francisco Conservatory of Music students, faculty and alumni; concurrent special events from the Westfield Historical Keyboard Center and the second International Early Music Film Festival; and special lectures, masterclasses and colloquia. Main stage events take place at St. Mark's Episcopal Church, 2300 Bancroft Way, Berkeley, CA, with additional events at First Congregational Church, 2345 Channing Way, Berkeley. There is a clear reason The New York Times calls Avery Amereau "A Rarity in Music." It's her voice. She is a rare contralto and not many of them exist. Joyce DiDonato says Avery's voice is "like velvet, caramel chocolate." And now, San Francisco Bay Area audiences will get a chance to hear her unique timbre when Avery Amereau makes her PBO mainstage debut in April's season finale, "Beethoven Unleashed." Philharmonia Baroque Orchestra is excited to welcome Avery Amereau to our cast of esteemed guest singers in our season finale April 25-29. We hope you'll join us. Salon/Sanctuary presents At the Pleasure of Mazarin: Roman Treasures from the Bibiothèque Nationale de Paris, the season finale concert and the final concert in a mini-series of early music concerts that explores the echoes of politics in over half a millennium of French music. For tickets, call 1 888 718 4253 or visit http://www.salonsanctuary.org. 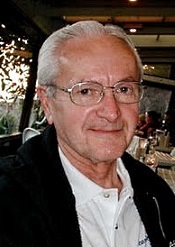 For sound clips, program notes, texts and translations, and more information, visit http://www.mazzarinomusica.org. Cellist Corinne Morris will give the world premiere of Nimrod Borenstein's Cello Concerto No. 2, alongside the BBC Philharmonic Orchestra on 5th June, 2018. Frederic Chaslin will conduct, at BBC Philharmonic Studio, Salford. The concerto, written for Morris, is intended to be "a large-scale, muscular concerto in the grand tradition of Dvorak, Shostokovich and Elgar", according to its composer. This followed an idea by the cellist, who felt that these kinds of 'big' concertos for cello were increasingly rare. Borenstein, who has a long-standing artistic relationship with Morris, was happy to oblige. "Corinne has a certain scale and richness to her playing, which gives the composer that facility, and it's a joy to have that kind of canvass." he says. World Premiere of Ellen Reid's "dreams of the new world"
An expansive new choral work exploring lesser-known stories about the pursuit of the American Dream in Memphis, Houston, and Los Angeles, told through an interview-based libretto, will be premiered by the Los Angeles Master Chorale on Sunday, May 13 at 7 PM in Walt Disney Concert Hall. dreams of the new world is composed by Ellen Reid with a libretto by Sarah LaBrie. Tickets can also be purchased in-person at the Dorothy Chandler Pavilion Box Office Monday – Saturday, 10 AM–6 PM. Schimmel Center and Knickerbocker Chamber Orchestra Present "The Struggle to Forgive"
Schimmel Center, NYC, with the Knickerbocker Chamber Orchestra presents the world premiere of The Struggle to Forgive: Confronting Gun Violence in America on Friday, May 4, 2018 at 7:30 p.m. Led by Music Director and Conductor Gary S. Fagin, the new cantata—which has a libretto by Fagin and features soprano Mikaela Bennett, mezzo-soprano Sarah Heltzel, and baritone Jorell Williams—gives voice to those whose lives have been impacted by gun violence in the United States, including victims and their families. The program also includes Charles Ives's The Unanswered Question; and a new orchestral version of Prayer for Mary, written by Fagin in remembrance of the life of a KCO member whose life was lost due to gun violence in 2014. Concerts at Saint Thomas will give the season's final performance with the Saint Thomas Choir of Men and Boys on May 9, singing music written for the Feast of the Ascension. The program features Bach's Cantata 37, his first written for the Ascension, and his 'Lutheran' Mass in G minor, as well as Vivaldi's lesser-known setting of the Introduzione e Gloria, RV 588. The choir will be joined by soloists Eric S. Brenner, Lawrence Jones, Mark Bleeke, and Daniel Moore, and accompanied by period instrumentalists from the Orchestra of St. Luke's. Five Boroughs Music Festival Presents TENET in "The Sounds of Time"
The early music virtuosi of TENET return to Five Boroughs Music Festival (5BMF) this season with "The Sounds of Time," an exploration of 12th and 13th century songs by the French trouvères. The program is presented in Queens, NY on Friday, May 11, 2018 at 7:00 p.m. at King Manor Museum, NY, and on Saturday, May 12, 2018 at 7:30 p.m. at Christ Church Riverdale in the Bronx. Led by guest music director and baroque violin virtuoso Robert Mealy, the program showcases the great lyric tradition of the troubadours, who adapted the musical forms invented by their Provençal counterparts and infused them with a lighter vein that produced a memorably tuneful body of music. "The Sounds of Time" features soprano Jolle Greenleaf, mezzo-soprano Luthien Brackett, tenor Jason McStoots, Shira Kammen and Robert Mealy on vielle and harp, and Charles Weaver on plucked instruments. Friday, May 11, 2018 at 7:00 p.m.
Tickets: Tickets, priced at $15 for general admission and $10 for students, seniors, and museum members, can be purchased by visiting www.5bmf.org. Tickets: Tickets, priced at $25 for general admission and $15 for students, seniors, and Christ Church Riverdale members, can be purchased by visiting www.5bmf.org. We are very proud to present our latest image video to you today! You can hear us in Bari (19 April), Heidelberg (21 April), Bilbao (23 April), Zaragoza (24 April) and Barcelona (26 April) with a programme featuring works by Schumann and Beethoven. The ASPECT Foundation for Music & Arts presents its final concert of the season, "Fête Galante: The Anatomy of Melancholy" on Thursday, May 17, 2018 at 7:30pm at the Italian Academy at Columbia University, part of the foundation's second New York City season of illuminating performances featuring many of the most prominent performers and musical scholars of today. Féte Galante features the acclaimed New York-based Four Nations Ensemble and soprano Sherezade Panthaki, with an illustrated talk by art historian Tav Holmes. The concert provides insight into the elegant new style of art following the final years of the reign of Louis XIV. While Versailles was draped in the heavy mood of recent years, Antoine Watteau was breaking with tradition, creating the new fresh, elegant, and sensual genre of the fête galante. The evening features Four Nations Ensemble and Panthaki in works by Leclair, Clérambault, Devienne, and Telemann to emphasize Holmes' glimpse into the unique, idealized world of artists Watteau, Boucher, and Fragonard. "Fête Galante: The Anatomy of Melancholy"
Music Director Jeffrey Thomas will lead the American Bach Soloists in performances of all four of Johann Sebastian Bach's Orchestral Suites (BWV 1066-1069) May 11-14 in Belvedere, Berkeley, San Francisco, and Davis, CA. The works presented in these concerts are full of exuberant sonority and captivating melody and display the virtuosity of ABS's famous roster of "the best American specialists in early Music" (The Washington Post). These extremely popular pieces are intensely infused with the spirit of dance, expressing joy and felicity. Tickets: $25–$89; $10 student tickets for ages 25 and under with valid student ID, at the door or reserve at 415-621-7900. San Francisco's 42nd Street Moon (Daren A.C. Carollo and Daniel Thomas, Co-Executive Directors), currently celebrating its 25th Anniversary in continuous operation, has announced the full cast and creative team for the final production of the 2017-2018 season: ME AND MY GIRL, a hilarious and delightful 1930s West End smash hit (winner of three Tony Awards for the critically-acclaimed 1986 Broadway revival). ME AND MY GIRL features book and lyrics by L. Arthur Rose & Douglas Furber, revised by Stephen Fry with contributions by Mike Ockrent, and music by Noel Gay. ME AND MY GIRL runs from May 2 – 20, 2018 and will perform at San Francisco's Gateway Theatre (formerly the Eureka Theatre). The press opening will take place on Saturday, May 5 at 6:00 p.m. Tickets range from $25 - $75 and can be purchased through the Box Office at (415) 255-8207 or online at www.42ndstmoon.org. 42nd Street Moon's production of ME AND MY GIRL will be directed and choreographed by Mindy Cooper, with Music Direction by Dave Dobrusky. May 2 - 20, 2018 (press opening on Saturday, May 5 at 6:00 p.m.). Wednesday-Thursday 7:00 p.m.; Friday 8:00 p.m.; Saturday 6:00 p.m.; Sunday 3:00 p.m.
Gateway Theatre, 215 Jackson St, San Francisco, CA 94111. Running time: 2 hours and 15 minutes (including a 15-minute intermission). 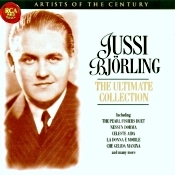 Jussi Bjorling, tenor; with various artists. RCA 74321 43468 2 (2-disc set). When RCA released one of their sets of Caruso recordings, they labeled it "The Greatest Tenor in the World." 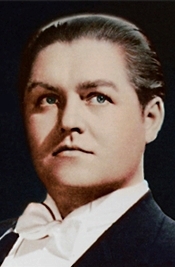 Certainly, the fans of Swedish tenor Jussi Bjorling (1911-1960) might have a say about that. This two-disc set of Bjorling recordings is in RCA's "Artists of the Century" line, which also includes the aforementioned Caruso, Leontyne Price, Mario Lanza, and others. The Bjorling set contains twenty selections on the first disc and twelve more on the second for a generous total of 156 minutes, plus an informative set of booklet notes. Bjorling was in his forties and at the height of his career when RCA made these recordings between 1950-1959, just before his untimely passing in 1960. They demonstrate a voice that is at once strong and robust yet lyrical and soaring. He was able to float a high note sweeter than most anyone on stage and to maintain an amazingly clear enunciation in the process. The first disc contains short, popular pieces: Verdi's "Celeste Aida," "La donna e mobile," Puccini's "Che gelida manina," "Nessun dorma," "E lucevan le stelle," Leoncavallo's "Vesti la giubba," Flotow's "M'appari tutt'amour," that kind of thing. The second disc contains fewer but longer pieces, Puccini's "Mario, Mario, Mario!," Verdi's "Dio, che nell'alma infondere," etc., and both discs give us a few recital pieces by Schubert and Strauss. The highlight of the set may be his live concert performance of "Nessun dorma," done with piano accompaniment and preceded by an enthusiastic request shouted out by an audience member. This live rendering nicely complements his version with full orchestra that the folks at RCA also include. Naturally, the digitally remastered audio quality varies from one piece to the next, some done in monaural, some in stereo; but none of it sounds overly compromised by noise reduction. A few of the songs are brighter, rougher, and edgier than others, it's true, but that we should expect. Compared to an earlier collection of Bjorling recordings from the thirties and forties on EMI, the RCA sound is cleaner, clearer, and more open. And, amazingly, the later voice had lost hardly an iota of its youthful vigor. This must be counted among the best compilations of the great tenor's work on disc. Also, Romances; Schubert: Rondo. 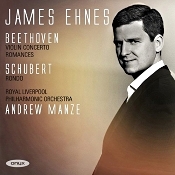 James Ehnes, violin; Andrew Manze, Royal Liverpool Philharmonic Orchestra. Onyx Classics 4167. The invention of the violin predates the piano by several hundred years and violins comprise the biggest part of an orchestra; yet from the Classical Period onward, the piano has dominated the concerto field. Maybe that's as it should be, given that so many composers of classical music were also pianists. Nevertheless, the violin hung in there, with the Beethoven Violin Concerto in D major, Op. 61 being one of the most prominent. It's good to welcome any new recording of it. Canadian violinist James Ehnes tackles the project this time out. As he is a musician who has always impressed me as levelheaded, elegant, and graceful, he seems just the right fellow for the job. Beethoven wrote his violin concerto in 1806 and premiered it to a surprisingly indifferent response. It wasn't until well after the composer's death that it finally took off and became a staple of the violin repertoire. Beethoven structured the concerto traditionally, with an expansive opening movement, a serene slow movement, and a sprightly conclusion (with no break between the two final movements). A number of prominent violinists have written their own cadenzas for the work, and Mr. Ehnes uses the popular ones by Fritz Kreisler. After the fairly lengthy orchestral introduction, which Maestro Andrew Manze handles with a casual command, Ehnes enters exhibiting a sweet, unforced tone that he will maintain throughout the piece. Although Ehnes hasn't quite the stylistic dominance of a Heifetz or a Perlman, he is quite good, especially in his emphasis on contrasts. They are not pronounced to any extreme, but both he and Manze place just enough stress on softer and louder notes, quieter and more tumultuous passages, and shorter and longer pauses to make this interpretation stand out. In other words, even though the tempos are just a tad on the quick side, you'll find enough variation in the performance to keep it fresh without distorting the composer's intentions. Needless to say, Ehnes's playing is exceptionally deft. His nimbleness in even the most difficult sections is a joy, clean and clear and virtuosic. This is an imaginative, highly rhythmical, yet charmingly lyrical reading that sweeps one along effortlessly. The second-movement Larghetto is sublime, and Ehnes handles it smoothly and unfussily. His playing is delicate and lilting, his phrasing light and airy; it's as lovely a rendering as any you'll find. Then Ehnes and the orchestra make the transition to the delightfully energetic finale with an easy grace and sustain the high spirits to the end. For couplings, Ehnes provides Beethoven's Romances for Violin and Orchestra, Nos. 1 and 2 and Franz Schubert's little Rondo in A major. Interestingly, Beethoven wrote the second of the Romances (1798) a few years before he wrote the first one (1802), but because of their order of publication, the latter one gets the earlier number. And it's not even clear why Beethoven wrote them; that is, for what occasion. Whatever, they are highly popular and strongly Romantic. The Romance No. 1 is the slightly more serious of the two, which may have something to do with Beethoven's own development as a composer. In any case, all of the good traits we heard from Ehnes in the concerto we hear again: grace, elegance, refinement, and imagination. Producer Simon Kiln and engineer Arne Akselberg recorded the music at Liverpool Philharmonic Hall in September and October 2016. The sound is very natural, the orchestral sonics wide and deep, with no undue spotlighting and a modest room resonance. The solo violin is well integrated with the orchestra, in front but not in our face. The violin, too, sounds lifelike: clear and vibrant but neither hard nor bright. Frequency response is reasonably wide as are the dynamics throughout, so it's realistic recorded sound. Overall, taking into account performance and sound, this recording must take a place among the better choices one can make in the work. Even though Ehnes and company are in a crowded field, they have made a place for themselves. New York Opera Alliance (NYOA), a consortium of New York opera companies and producers, presents the third annual New York Opera Fest (nyoperafest.com), a two-month celebration of opera on an unprecedented scale that takes place throughout May and June, with over 20 New York City-based companies large and small, putting on over 30 events in venues around the city, including World Premiere performances of 12 new works. The Fest shows opera in its myriad forms, from world-class productions of traditional favorites, to the far-flung fringes of innovation and instigation that drive the art form forward. The staggering breadth of offerings on display presents a raw, un-sanitized snapshot of all that opera is, has been, and can be. 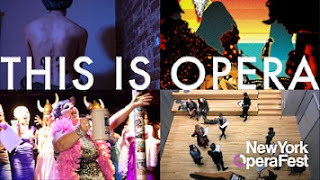 This year's Fest includes Experiments in Opera releasing a serial podcast opera, a #MeToo take on Mozart's Don Giovanni by Heartbeat Opera, the World Premiere of a jazz opera based on the life of 1920s avant-garde Parisian Kiki de Montparnasse by Cantanti Project, Hunter Opera Theatre and American Opera Projects performing three one-act Premieres, New Amsterdam Opera presenting Donizetti's rarely heard La Favorita in a performance dedicated to Dmitri Hvorostovsky, Operamission's binge-watchable behind-the-scenes look at Handel's Teseo, and many more productions in locations ranging from a pub to a public library, a playground to a playhouse. Philharmonia Baroque Orchestra & Chorale announces its 2018/19 season--"Transcendence." In its 38th year, PBO will continue to take its signature brand of historically-informed performance to the next level with its subscription season, alternative concert series PBO SESSIONS, Juilliard partnership and its national tour schedule. Philharmonia's 2018/19 season promises an eclectic array of music and experiences, including sacred vocal works by Bach, Mozart, and Pärt, virtuosic concerti by Vivaldi and Clement, and Handel at his dramatic heights. Starting in October, Mozart's "Exsultate, jubilate" sets the tone for an exuberant season in an all-Mozart program featuring the Philharmonia Chorale and soprano Camille Ortiz who appeared in Philharmonia's operatic production of Rameau's "Le Temple de la Gloire" in 2017. The Neue Zürcher Zeitung reported, "The first of three performances...caused a storm of enthusiasm among the audience...The Tonhalle Orchestra was spurred on by Trevino to a peak performance, proving again the enormous artistic potential it can mobilise with appropriate leadership." More and more leading orchestras are noticing. The coming months will include returns to the London Philharmonic, Sao Paulo Symphony, Helsinki Philharmonic, Dresden Philharmonic, RTVE Madrid, NDR Hannover, Malmo Symphony, Barcelona Symphony and RTE Dublin among others, and debuts with the Bournemouth Symphony and MDR Leipzig. Musica Viva NY celebrates its 40th anniversary with a concert entitled "Sunrise in the City" on Sunday, May 20 at 5:00 p.m. at All Souls Church, NYC. The performance, which features the Musica Viva NY Choir led by Artistic Director Alejandro Hernandez-Valdez, includes the world premiere of Ars Poetica #1002: Rally by Elena Ruehr, commissioned by Musica Viva NY in celebration of its 40th anniversary. Also on the program is Mahler's "Ich bin der Welt abhanden gekommen" ("I am lost to the world") in a choral arrangement by Clytus Sottwald; the New York City premiere of Maarten Spruijt's Thurémin; and Ola Gjeilo's Sunrise Mass. Works are accompanied by a string orchestra which includes the Aeolus Quartet. Noon walks along jetties to historic lighthouses and trails overlooking blueberry bogs, afternoons wandering along the dramatic shore where tidal pools hold secret worlds, or strolling through charming downtown… all part of the local culture in Damariscotta. And for 2 weeks every summer - evenings filled with the music of the Salt Bay Chamberfest, exciting world-class chamber music performances in the intimate setting of Darrows Barn, an historic 19th-century dairy barn turned concert hall perched on the promontory of Great Salt Bay. Salt Bay Chamberfest (SBC)'s 2018 season Troubadours & Tangos traces the intriguing origins of the guitar from its ancestry of the oud and lute, through the Renaissance to today, culminating in an SBC newly commissioned work, written by the award-winning and trailblazing composer and electric guitarist Steven Mackey, for the acclaimed Brentano String Quartet and SBC Artistic Director and cellist Wilhelmina Smith. Ancient laments and modern ballads will inspire a season where the vernacular and Western classical art music join forces to lament, sing, and dance the tango! All Festival concerts begin at 7:30 pm at Darrows Barn (pre-concert talks with Mark Mandarano begin at 6:30), Round Top Farm, Business Route 1, Damariscotta, Maine. For tickets and more information, call (207) 522-3749, e-mail contact@saltbaychamberfest.org, or visit www.saltbaychamberfest.org. International music stars Frederica von Stade, Joyce DiDonato, and Jake Heggie are teaming up to support the San Francisco Community Music Center's scholarship programs at a spring gala on Saturday, May 12. Joyce DiDonato will be giving her final performance in the title role of Cendrillon at the Met the night before on May 11. How is it that Joyce DiDonato, one of the world's biggest opera stars, is flying out the night after finishing a run at the Met to sing at a gala for a community music organization? This year's Community Music Center Spring Gala is a story of enduring friendship and admiration between world-renowned artists Frederica von Stade, Joyce DiDonato, and Jake Heggie and their whole-hearted support of CMC's visionary mission of free and low-cost access to music education for all people. Celebrate Cinco de Mayo early with "Modern Mexico" a guided Mezcal tasting led by master distiller Alejandro Aispuro, including samples from his private collection, paired with a concert of Mexican contemporary classical music, May 1 at The Bowery Electric and (Le) Poisson Rouge, NYC. Co-produced by Unison Media, the WFMT Radio Network, and Access Contemporary Music, the event will feature mezcales that are unavailable for purchase anywhere, followed by a concert of New York City premieres of works by Gabriela Ortiz, Felipe Pérez Santiago, Ana Lara, Hilda Paredes, and Mexico's most celebrated living composer, Mario Lavista. The University of Southern Maine School of Music announces the premiere of an original work "Girl in Six Beats," commissioned by Opera Maine and created in collaboration with The Telling Room. USM Opera Workshop students will perform the one-act chamber opera, which features a libretto written by students of The Telling Room. The music was composed by Dan Sonenberg, composer-in-residence at USM, whose opera The Summer King had its world "fully-staged" premiere last spring with the Pittsburgh Opera. "Girl in Six Beats" will premiere Saturday, April 21, 8:00 p.m. and Sunday, April 22, 2:00 p.m. at Corthell Concert Hall, USM Gorham Campus, and then travel to two local schools (home to some of the students who created the libretto), to be performed for their students. Tickets: $8 adults, $5 for students, seniors, USM employees and alumni. 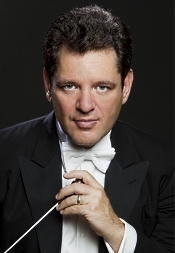 The Massapequa Philharmonic, the principal orchestra serving Massapequa and Long Island, has extended David Bernard's contract as their Music Director. The extension secures Bernard's position with the orchestra until 2020. Having taken up the Music Director's baton in 2016 after a number of successful years of guest conducting there, Bernard's first seasons with the MPO have been a hearty success. As well as pushing artistic standards ever-higher, Bernard has brought his popular and accessible 'InsideOut Concerts' concept to the orchestra, formed partnerships with local businesses and arts institutions. One of his most admired accomplishments has been the partnership with the Eglevsky Ballet, resulting in that company's first run of Nutcracker performances with live orchestra for years. Bernard, who is also Music Director of the New York City-based Park Avenue Chamber Symphony, says, "I knew from the first moment on the podium with this wonderful MPO family that this would be a special relationship." On March 14th, Touro University invited the Foundation to Assist Young Musicians Mariachi Estrellas de FAYM to perform at their student talent show. Several individual and small groups of students performed comedy, dance, and music numbers. Some of the performances were accompanied by Touro University staff members. It was exciting to see artistic performances by students that were enrolled in a variety of academic programs with most of them working towards medical careers. Eventually, it was time for our Mariachi Estrellas de FAYM to take the stage. While our students were much younger than the performances we had already seen, it was amazing to see them step up, position themselves, and start their songs. The room was filled with awe as they played their first song and a loud and excited applause followed. They began their second number and a little into the song, Guadalupe stepped forward with the microphone and started singing. The audience were completely amazed at the talent of the musicians and the vocalist. Princeton University Concerts ("PUC")'s 2018-19 season will celebrate the series' 125th anniversary with a set of performances that redefine the scope of what a chamber music series can encompass. Building on PUC's long history of offering the absolute pinnacle of talent, the concerts and initiatives will blur the lines of genre, build new relationships between audiences and performers, and expand the boundaries of the concert experience. At the heart of the new season is the series of concerts and events centered around PUC's first Artist-in-Residence, conductor Gustavo Dudamel. The Maestro, currently the Music & Artistic Director of the Los Angeles Philharmonic, will visit the Princeton campus three times throughout the 2018-19 season. Subscriptions to the 2018-2019 season will go on sale in May. Interested individuals are highly encouraged to secure their tickets as early as possible. Patrons can choose from a flexible variety of subscription packages online at princetonuniversityconcerts.org or by phone at 609-258-2800, Monday-Friday, 10AM-4PM. On Saturday May 5th 2018, the Salisbury Symphony will become the first orchestra in the U.S. to perform alongside a country music band when it presents a joint concert with Darrell Harwood. The first half of the concert will feature the Salisbury Symphony Orchestra performing well-known Western tunes including Bernstein's "Magnificent Seven," Williams's "Cowboys Overture," Copland's "Rodeo," Albert's "Western Suite," and Daughtery's "American Gothic: Pitchfork," while the second half of the concert will feature Darrell Harwood and his band and include orchestral arrangements of Harwood's original songs including "Out With A Bang," "One For The Money," "Fixer Upper," "Love You More," "Stand Together," "Mama I Hate To See You Cry," and "Magic Cowboy Hat." Harwood, who hails from China Grove, NC, is one of country music's most prolific artists, performing over 150 shows up and down the East Coast each year. He has won numerous accolades including the 2016 CMA Country Male Artist Award and 2017 Carolina Artist Showdown Humanitarian Award. Harwood's fast-paced high-energy country rock has earned him a reputation as a powerhouse performer and a loyal following throughout the Southeast.